Fishing in Tuscany for visitors is a little known pleasure. Though the ports along the coast have been established as fishing villages for thousands of years, and many Tuscans enjoy the sport, it has not been developed commercially as a tourism activity. Viareggio is one town where the history of fishing goes back longer than the written word. Today, Viareggio is a smart tourist destination and a great producer of world class yachts but it also is still home to a small fishing industry. Over fishing of the Mediterranean means that the fishing industry is nowhere near as large as it used to be although you can still pick up fresh fish quayside, brought back by small scale fishermen. Some of these fishermen are diversifying and taking tourists out on their boats, offering a full or half day of fishing for either beginners or professional fishers. You can even take the kids (with appropriate supervision!). Fishing trips can be done at any time of the year, weather permitting, and in summer you can even take a night time excursion – an experience which is really special. After fishing, often the hosts will cook your catch on board and you can enjoy a feast with your friends of fresh fish (hopefully, although if you don’t catch anything they will make sure you don't go hungry!). If you are not so interested in fishing there are other reasons to go out in a boat on the Tuscan coast. You can see the beautiful coastline from a different perspective, visit the islands of the Tuscan archipelago and watch the dolphins playing off the Etruscan coast. All whilst enjoying a glass of prosecco and waiting for someone else to catch your dinner. Things to remember when planning a fishing trip: If you are new to sea fishing the first thing you need to check is if you get seasick. If you are not sure then take appropriate medicine with you just in case. The top fishing boat accident is falling overboard – be vigilant with children and don’t drink too much. Accident number two is getting hooked… not in the sense of becoming a fan but actually managing to impale yourself on your fishing hook. Be careful and constantly aware of where your line is. Wear sensible shoes (preferably training shoes) that will not slip on wet surfaces. 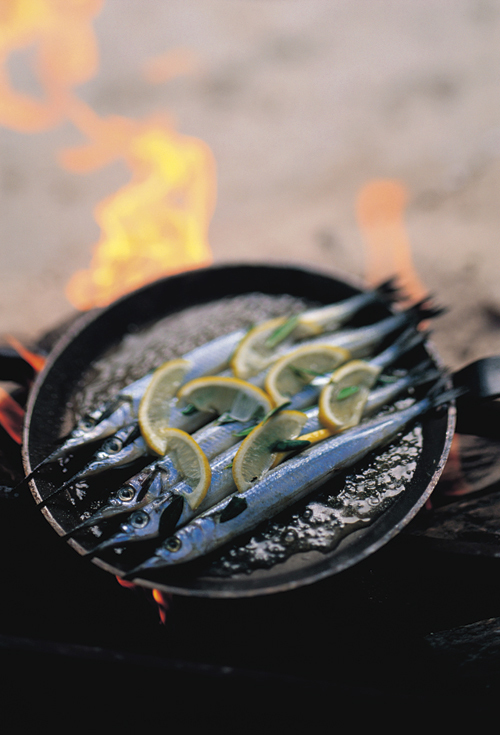 Don’t be squeamish – those fish need bopping over the head if you want to eat them for supper.